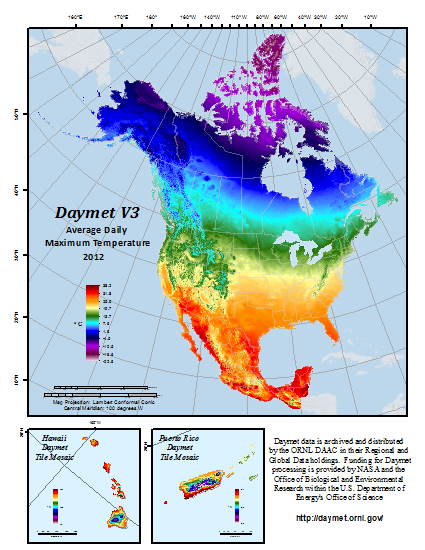 This data set provides Daymet Version 3 model output data as gridded estimates of daily weather parameters for North America and Hawaii: including Canada, Mexico, the United States of America, Puerto Rico, and Bermuda. The island areas of Hawaii and Puerto Rico are available as files separate from the continental land mass. Daymet output variables include the following parameters: minimum temperature, maximum temperature, precipitation, shortwave radiation, vapor pressure, snow water equivalent, and day length. The data set covers the period from January 1, 1980 to December 31 of the most recent full calendar year. Each subsequent year is processed individually at the close of a calendar year. Daymet variables are continuous surfaces provided as individual files, by variable and year, at a 1-km x 1-km spatial resolution and a daily temporal resolution. Data are in a Lambert Conformal Conic projection for North America and are distributed in a netCDF file (version 1.6) format compliant to Climate and Forecast (CF) metadata conventions. Mosaic files are available for download from the ORNL DAAC. In addition, all Daymet Tools and Services now distribute version 3 data. Daymet V3 was processed with a new suite of input data and algorithm improvements which better address the station data search radius in areas of low weather station density. Thornton, P.E., M.M. Thornton, B.W. Mayer, Y. Wei, R. Devarakonda, R.S. Vose, and R.B. Cook.